I ended my previous post on the subject by noting that emerging market Central Banks were at a crossroads. Either they would raise interest rates and accept currency appreciation, or they would risk hyperinflation and economic instability. While the jury is still out on a handful of cases, it looks like most of the emerging market countries in Asia have chosen the former. In February, the Bank of Indonesia raised its benchmark interest rate to 6.75%, from a record low of 6.5%. The People’s Bank of China (PBOC) has now hiked rates three times in the current tightening cycle. After a hike in January, the Bank of Korea inscrutably decided to hold rates in February, but signaled that another rate hike in March is likely. The Central Bank of The Philippines similarly indicated that it is ready to embark on a program of tightening. The same goes for the Reserve Bank of India (RBI). So far the main holdout is the Bank of Thailand, whose interest rates are still the lowest in Asia (ex-Japan) and remains reluctant to raise them too quickly. 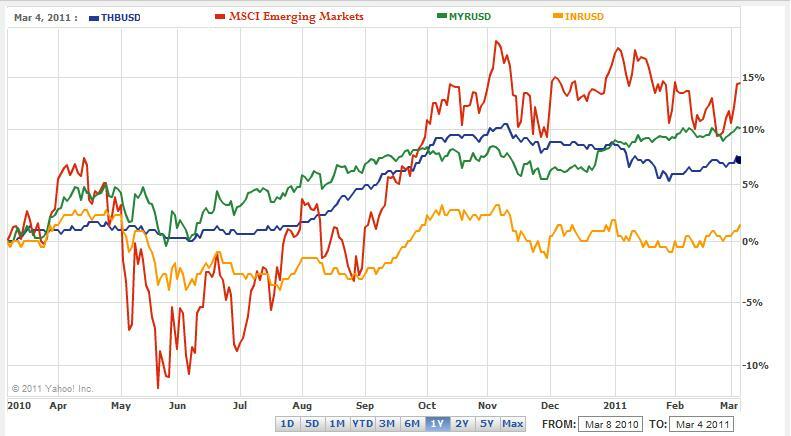 Towards the end of January and the beginning of February, most Asian EM currencies sputtered in their appreciation. While there were a number of reasons for this (notably a pickup in risk aversion), Central Banks rejoiced in their perceived victory of foreign currency speculators. Unfortunately, there were a few downsides to this. First of all, capital outflow produced marked declines in Asian stock and bond markets, raising borrowing rates for everyone making it more difficult for domestic firms to raise capital. Meanwhile, inflation continued to rise, with no signs of slowing. 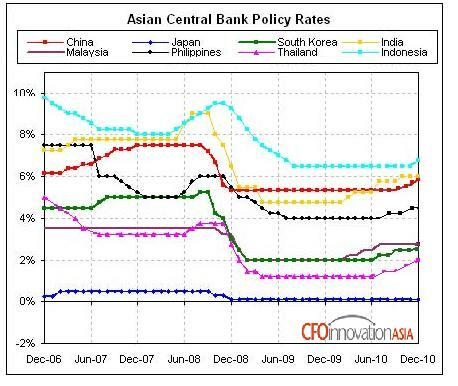 Thus, as I remarked the last time around, it was inevitable that (Asian) Central Banks would inevitably come to their senses. First of all, they realized that there was no free lunch, and that controlling their currencies would disable them from using traditional monetary policy tools to fight inflation. Second, while they could do without currency appreciation, they realized that this would have to be tolerated if they wanted to continue attracting foreign investment. (That’s because, as the Financial Times pointed out, currency appreciation probably accounts for half of all emerging market investment returns). Third, it is inevitable that emerging market currencies will continue to rise over the long-term, in line with productivity gains. According to the Balassa-Samuelson effect, “countries with above average real income growth should have rising price levels, relative to other economies, and strengthening real exchange rates.” Based on this notion, emerging market currencies are forecast to rise by an average of 1.7% per year for the next 10 years. Finally, in accordance with the unofficial rules of the currency war, emerging market countries are competing not with industrialized countries, but with each other. If all of their currencies rise in unison, export competitiveness is unaffected, inflation is tamed, and foreign capital remains abundant. It would seem to be a win/win/win. In fact, it seems like investors are less interested in distinguishing between the different emerging market currencies of Asia, since at this point, all of them offer similar currency appreciation (over the last six months, returns have converged) and similar inflation-adjusted carry. Thus, it stands to reason that as Asian Central Banks continue to tighten interest rates, their currencies will continue to rise together.